A loose permanent tooth is not a good thing—and not something you should put off having examined. That’s because a loose tooth could soon become a lost tooth. How we treat it depends on its underlying cause, which could be one of two types. One is primary occlusal trauma, meaning the affected tooth has experienced accidental trauma or higher biting forces than it normally encounters. This usually happens because of teeth grinding habits. It could also be secondary occlusal trauma. Unlike primary trauma where the supporting gums and bone may be reasonably healthy, secondary trauma occurs because these structures have been severely damaged by periodontal (gum) disease. As the gums begin to detach from a tooth and its underlying bone deteriorates, even normal biting forces can loosen it. If gum disease is present, our first priority is to bring it under control. We do this primarily by removing all dental plaque (a thin film of bacteria and food particles that triggers the infection and sustains it) and calculus or tartar (calcified plaque). This can take several sessions and, in the case of deep infection, may require a surgical procedure. On the other hand, if teeth grinding is the primary cause, we’ll focus on minimizing the habit and its effects. One way is to create a custom-fitted guard worn to prevent upper and lower teeth from making solid contact. You may also need to improve your management of stress—another factor in teeth grinding—through medication, therapy or biofeedback. In either case, improved periodontal health will help the gums naturally regain their strong attachment with help, if necessary, from gum tissue or bone grafting surgery. But this healing process can take time, so we may need to secure a loose tooth in the interim by splinting it to neighboring stable teeth. This usually requires bonding rigid material or metal across the back of all involved teeth or in a channel cut along the teeth’s biting surfaces. In this way the more stable teeth support the loose one. Splinting may be temporary as the mouth heals from disease or trauma and the teeth regain their stability. In some cases, though, it may be permanent. 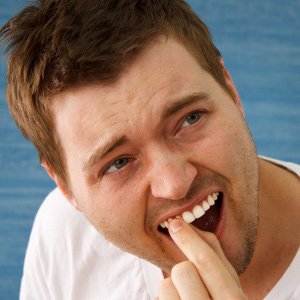 Either way, dealing promptly with a loose tooth can help ensure it’ll survive—so see your dentist as soon as possible.